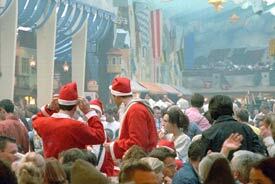 ABOVE: Two St. Nick wannabes get an early start on their Christmas spirits at Oktoberfest in Munich, Germany. Munich's Oktoberfest is justly renowned as the world's largest kegger, but it's far more than a beer bust. The annual 17-day festival offers some 200 sideshows, carnival rides, and other amusements, so you'll find something to do at the Wiesn (as the Oktoberfest grounds are known) even if you're a teetotaler who disapproves of vomiting as public recreation. Still, there's no doubt that suds are the liquid centerpiece of Oktoberfest, which traces its origins to a wedding celebration for Ludwig I of Bavaria and his bride in 1810. In a typical year, Oktoberfest will attract some 6 million vistors who collectively down approximately 6 million liters (1.5 million gallons) of special Oktoberfest brew. That's a lot of beer, even when diluted by 87 spit-roasted steer, 459,259 roasted chickens, and 219,405 pairs of sausages. Most of the serious guzzling takes place in 14 beer tents, or festival halls, which offer tables and seating for 100,000 patrons. Six of the tents are operated by Munich breweries, and each of the 14 has its own unique character--from the relatively intimate 3,400-seat Hippodrom to the 9,300-seat Schottenhamel, where the mayor of Munich cries "O'zapft is!" as he taps the first keg of beer on the opening day of Oktoberfest.